Myrailtrip.co.uk is the home of Ffestiniog Travel's ticketing department and prides itself on being a one stop shop for rail journeys throughout the United Kingdom and Europe. We are agents for the main ticketing and rail operators throughout Europe and in a position to secure the best deals and offer more routes than most other rail ticket retailers. No matter how large or small the journey, Ffestiniog Travel's ticketing team makes the buying of rail tickets as easy as possible. By using their experience and specialist knowledge, our ticket only consultants will work out the most convenient route for your needs and book the most appropriate tickets for your journey. Each and every enquiry is handled personally which may involve some time. Therefore we cannot offer an instant quotation service but will spend the time to find you the best deal. Purchasing rail tickets in the UK can be a minefield with different types of fares, routes and validities. Our expert team can guide you through and obtain the correct ticket for your requirements. Rail travel doesn't have to be expensive, as it can sometimes appear, and we can advise you on the best time to travel or discuss all the options that might make your rail journey cheaper. If you are a student or aged between 16 and 25, travelling with children or if you are over 60 then it could be worth buying a railcard. Railcards offer a discount of up to a third off rail fares and depending on the journey can save you more than the full cost on the first use. We at Ffestiniog Travel are extremely proud of our European ticketing department. As one of the leading retailers of European tickets in the UK we have direct access to many rail operators booking systems and can provide tickets for the majority of trains in Europe. We will advise you on whether individual tickets or a general rail pass will be better and can arrange seat reservations for those trains that require booking. It is often cheaper to purchase a 'through' ticket to your destination rather than individual tickets for each part of your journey and we will work out the best route. Whether you require a simple point to point ticket or your journey is more complicated, with many stopovers en route, we will be more than happy to send you a detailed quotation. Rail passes are available for each country in Europe, in most cases the InterRail range are the most suitable. InterRail passes are also available for the whole of Europe covering travel for up to a month. When travelling in Switzerland you can't beat the Swiss Pass, this pass offers unlimited travel on Railways, boats and most alpine postbuses. The Pass also allows free travel on public transport in 38 towns and cities. Don't forget to ask for tickets from your home station, in most cases we can offer CIV tickets to London International. These fares, in addition to including the London Underground from your terminal station to London St Pancras, offer a level of flexibility and assurance that normal ATOC tickets don't. If your connecting train is late then Eurostar are bound by the International Conditions of Carriage (Convention Internationale pour le transport des Voyageurs or CIV) to carry you on the next available service. Some of the most evocative images of travel are those of the great train journeys of the world. In Canada – The Rocky Mountaineer and Canadian; In Australia - The Ghan, The Indian Pacific and The Overland; In Russia - The Trans-Siberian and Trans Mongolian. Ffestiniog Travel can advise and book many of the iconic train journeys of the world. We are also UK Sales Agents for Japan Rail Passes. If you are contemplating touring a Continent or country and have considered rail as the most enjoyable and sustainable way to travel, why not discuss with us the various options available? Ffestiniog Travel also arranges flight tickets. We can provide a comprehensive range of flights with departures from all UK regional and international airports. For longer flight routes, we can arrange stopovers en route or upgrade your seating arrangements from Economy up to Business Class, even to First if the cabin is available. You can find out more about our rail ticket only service at www.myrailtrip.co.uk. 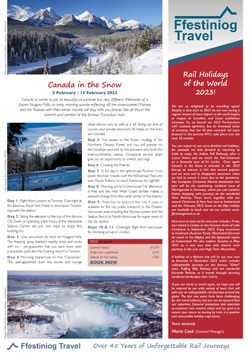 The website is constantly changing, providing news updates on train travel and special offers. You can be regularly alerted to all our travel news by liking our Facebook page at www.facebook.com/FfestiniogTravel.